Thyme, Thymus vulgaris, is a much-used herb and an attractive garden plant. It's low, shrubby branches form dense mats of tiny leaves. Small spikes of flowers cover the plant in summer, creating a mass of color in white, lavender or pink. Bees and butterflies love the herb, as do other beneficial insects, making it a great asset to an organic vegetable, herb or berry garden. Like other herbs in the mint family, it is native to the Mediterranean region and is strongly aromatic. It was used by Greeks and Romans as incense and added to bathwater. The Romans introducted it to England where it now grows wild. 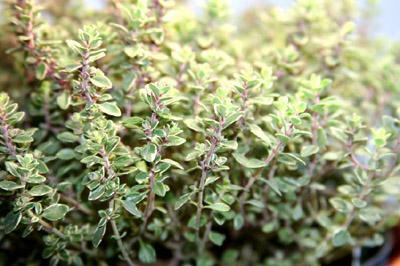 Thyme also grows in northern Africa and was used by the Egyptians in ancient times. It is still used in cosmetics for its sweet, pungent fragrance. The plant is hardy in zones 4-9. In most climates it is evergreen. Grow in full sun in rocky or sandy soil with good drainage. In poor soil, amend planting area with organic matter and sharp grit, or grow in a raised bed. The plant prefers neutral to alkaline soil. Space plants 6 inches apart. Thyme is an easy-going perennial, it has few pest or disease problems. Make more by layering plants or starting seeds indoors under lights. To grow from cuttings, dip 3- to 5- inch pieces of soft growth in rooting powder and stick in damp sand with bottom heat. Vegetative propagation ensures you'll get a good scent and flavor from your new plants. Harvest during any part of the growing season. To gather quantities for drying, harvest early in the season when the stems are still soft. Cut back up to 1/3 of the height and pinch back regularly to delay flowering if you'd like to continue to harvest leaves. Plants can be cut back a second time in mid summer, then let plant rest until the next spring. Mulch plants over winter. In the kitchen it is frequently used in French and Italian cooking. It is one of the herbs in bouquet garni, along with bay and parsley, used to flavor soups and vegetable dishes. It's also wonderful with mushrooms. The liquor Benedictine is flavored with thyme. In the landscape and garden the herb works well in between stepping-stones and as edging. Plant it close to paths and patios where it can release its fragrance when brushed. It is an excellent rock garden plant and can be used as a ground cover on slopes. It makes a nice addition to containers, especially the variegated and golden leafed varieties. Thyme looks good in association with chives or ornamental alliums and the broader leaves of sage. The plant is used medicinally as an antiseptic, and for coughs, headaches and intestinal problems such as parasites.